Snakes and Lattes, a board game bar just opened in downtown Tempe along Mill Avenue. When is the last time you've sat down and played a board game? Clue. Monopoly. Battleship. Chutes and Ladders. Life. Cards Against Humanity. Exploding Kittens. 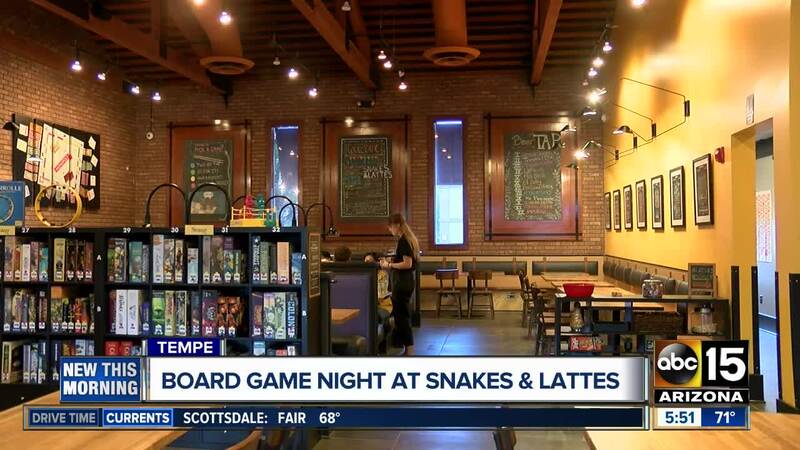 Snakes and Lattes, a new bar and cafe that recently opened in downtown Tempe, has more than 1,000 board games and card games in its libraries -- and all the pieces to go with them, too. The Canadian-based concept opened in the former Z'Tejas space near 6th Street and Mill Avenue, across from Dierks Bentley's Whiskey Row. It is the first location to open in the United States. "The founder went to Toronto and wanted to create a community place where people could come down, turn off their phones, turn off the laptops and sit across from each other and play games," said Susan Lawver, game curator at the Tempe location. They have board games where you play against the game itself, games where you play against another person, and games where you play against teams, Lawver said. "We have everything here," she said. "If there’s a game, we probably have it." What you will not find are electronic games. No gaming counsels like Playstation, XBox, Wii or computer games. Nor are there TVs. "Game Gurus" are there to help guide you through the library. "We can help pick a game that's tailored to your group. Tailored to your tastes and likes and how long you're going to be with us, how many are in your party. We’ll help you pick out a game and teach you how to play it," said Lawver. Game passes are $5 per person. You can bring your own games if you want, but there will still be a fee. The dining room has a mix of community tables, booths and high tops. There are roughly a dozen stools at the bar, and more seating out on the patio. The bar itself has 12 beers on tap, including brews from Tempe-based Four Peaks and Chandler-based SanTan Brewing Company. Hungry? They have food, too. Being a Canadian company, you'll find a half-dozen kinds of Poutine on the menu . Traditional Poutine is French fries topped with cheese curds and gravy. They also have salads, sandwiches, burgers and Naan pizzas on the menu. View menu . The cafe has different teas, coffees, lattes, and hot chocolate, including Nutella Hot Chocolate. It is open daily from 7 a.m. - midnight.